After a long day vineyard hopping, there is nothing more essential than a leisurely supper sampling the bounty of the surrounding farms and popping open that first bottle from your new collection. 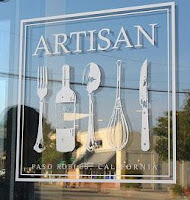 And as quickly as Mattei's Tavern secured the default dinner spot for the Santa Ynez Valley, in one meal the [upper] Central Coast positioned Artisan as my go-to after a day in the sun-drenched hills surrounding Paso Robles and Cambria. 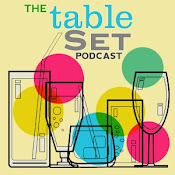 By day, my parents, sister and I sampled rich old vine Zinfandels at Turley, the infamous ISOSCELES (Bordeaux style blend of Cab Sauv, Merlot and Cab Franc) at Justin, the playful Moscato Allegro at Martin & Weyrich, "Liquid Love" Late Harvest Zin at Tobin James, and explored the Viognier and Cab-housing wine caves under Eberle. As dusk approached, we were ready for a well-deserved a rest. 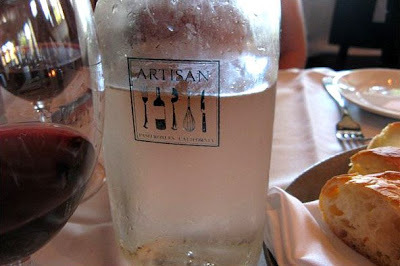 I had read about "American bistro" Artisan in Paso Robles where we decided to catch an early dinner, hoping it wasn't too stuffy for our casual attire and my [utterly charming!] 2-year-old niece. The contemporary, elegantly minimal dining room was mostly empty when we arrived, and luckily we were able to get in before the reservation-stacked dinner hour. The bluehour light filtered lazily through large shade-drawn windows onto clothed tables and the dark-wood floors, drawing an end to a perfect day. We were happy. Wine was opened (I'll be honest, I can't recall which we decided on - But corkage is a mere $10) and ordered a couple of appetizers. The toothsome Smoked Gouda and Porter Fondue with garlic toast, andouille sausage, and broccolini was devoured almost immediately. 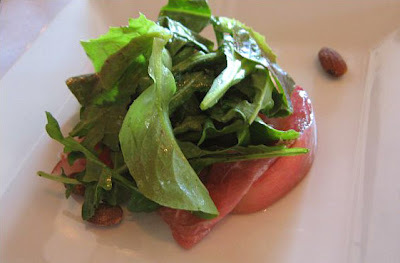 Its perfect foil was the Windrose Farms baby greens, stone fruit, La Quercia prosciutto, burrata, and smoked almonds. Perfectly ripe peach, crisp greens and buttery prosciutto.. a lovely palate cleanser after the smokey-rich fondue. Deciding on entrées was near impossible. My sister and I ended up picking two, and arranged to share. 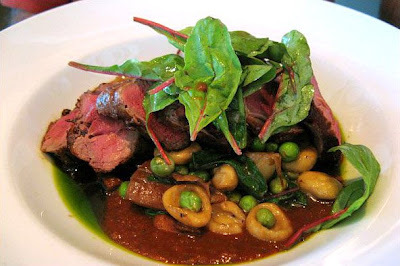 She ordered the Wild Boar Tenderloin, with house made orecchiette, english peas, porcini, and guanciale sauce. I caught our servers' smitten sway describing one of the specials, so went with that - a Hanger Steak with tempura fried shitake mushrooms, field greens, kentucky wonder beans, caramelized onions, and [I think] a shitake-balsamic reduction. 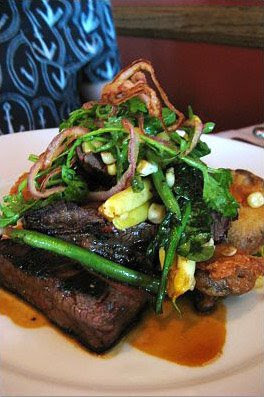 The hanger steak was one of the most marvelous dishes I've ever had. Nothing is better than a perfectly cooked steak (crispy char, pink center), but piled with crusted shitakes and farm-fresh veggies.. Love! The boar tenderloin was actually less gamey than I expected, and expertly matched with the rich porcini and english peas. The chewy-thick hand-made orecchiette was lovely texture compliment. I actually don't remember if I got around to the side of Jalapeño Cornbread with lavendar honey butter (there was already so much going on - and keep in mind I'd been drinking since 11am)... but BOY doesn't that sound lovely?? My whole life it's been rare for my family to stay for dessert when dining out, but Artisan was winning this battle, and the dessert menu somehow found a part of our brains not yet completely satiated by the wonderful meal. Because I am obsessed with Lillet Blanc AND crème brûlée, I didn't leave much room for anyone else's opinion. We ordered two desserts to share: the Lillet Blanc Cheesecake, summer berries, [on] lavendar shortbread -and- Trio of Crème Brûlée (butterscotch, chocolate, espresso) with cocoa nib sticks. Wow! The variety of the crème brûlée trio was "fun", but relatively unmemorable, paling next to the beautiful (Oh, presentation!) 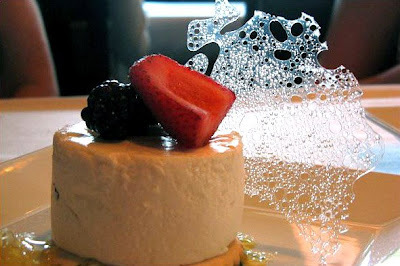 cloud-light cheesecake.